つい失言してしまい「言わなきゃよかった…」って後悔する事、ありませんか？そんなとき英語ではこう言います。I’m sorry. I didn’t really mean it. I take it back. Last week I discussed how to keep your house clean and you learned the expression “to put it back“. 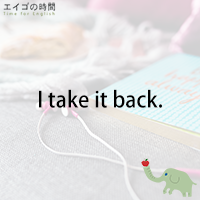 Today you’re going to learn another phrasal verb “to take it back”. So what does the phrase mean? How is it used? Well. To take it back is a good phrase to learn. That’s for sure. But still we should be very careful with our words, especially when we’re angry, because once you said something, it’ll be out there forever. Once it’s out, it’s out like toothpaste. You can’t put toothpaste back into the tube. Our words and opinions are much the same way. Now, would you like to try a quiz? This is again a multiple choice question. You’ll have three options and are expected to choose the one that is TRUE. Ready? Next Post あるべき場所 – Put it back where it belongs.